Air Force Junior ROTC students from Coatesville Area High School are making a lasting impact on the greater community. Here, cadets performed a flag folding ceremony at Hibernia Park for the residents of the Coatesville Senior Center in June. Photo courtesy PA 771 AFJROTC. COATESVILLE – For nearly 50 years, the Air Force Junior Reserve Officer Training Corps (AFJROTC) has been educating high school students throughout the world with the following core values: integrity first, service before self and excellence in all they do. 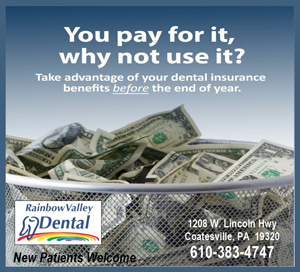 That is exactly what Lt Col (Ret) Eric Turnbull and MSgt (Ret) Chris Sidoli have been teaching their cadets since the PA771 AFJROTC program was brought back to the Coatesville Area Senior High School for the 2014 – 2015 school year. With over 850 service hours in their unit, the cadets have participated in several volunteer projects over the past school year and throughout the summer. Weeding and mulching the Raised Garden Beds on Lincoln Highway in Coatesville, is just one way the AFJROTC cadets volunteered their time this summer. Photo courtesy PA 771 AFJROTC. 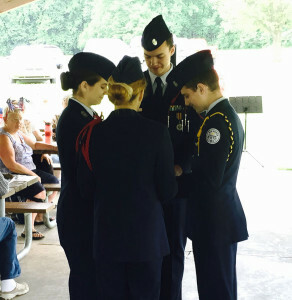 Through their partnership with the Coatesville Senior Center, cadets volunteered to perform a flag folding ceremony at Hibernia Park in June. Following the narration of U.S. Marine veteran Robert Haley and demonstrating careful attention to detail, the cadets impressed the residents of the senior center and Mr. Haley with their commanding presence. In addition, the Color Guard attended the CASD school board meetings through the summer to post the colors at the beginning of each meeting. After the Coatesville Food Kitchen experienced several maintenance issues, returning cadets assisted with clean up and restocked shelves as they sorted through 500 pounds of food items. This included removing expired items and reorganizing consumable food into groups, to place back on shelves or distribute to local families in need. In honor of 9/11, this past Friday night, first responders and cadets unveiled a 30 by 60 foot flag, followed by a moment of silence and the national anthem before the football game, Friday, Sept. 11. Most impressive perhaps, is the cadets’ work with the Chester County Food Bank. 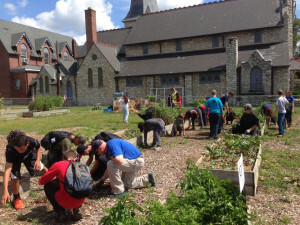 In addition to helping weed an maintain the Raised Garden Beds on Lincoln Highway, they traveled to Pete’s Produce Farm in West Chester and worked in 90-degree heat, harvesting tomatoes. In just a few hours, the cadets gathered 770 pounds of tomatoes, which was more than had been collected over the previous three days combined! Volunteers at the Chester County Food Bank commercial kitchen then washed all of the fresh tomatoes collected that day and made 40 quarts of tomato sauce. The sauce was frozen and will be distributed to Hunger Relief Stations in Chester County throughout the year. In addition, they traveled to Gibb’s Farm in Cochranville later in August and picked 1200 pounds of corn in just a few short hours. The fresh corn was sent to the CYWA Gateway Shelter that provides temporary shelter and refuge to homeless women and children in Coatesville. “It’s always fun to work with youth who are motivated…they were instrumental in the success of our summer season,” said Larken Kennedy, Volunteer Coordinator and Field Manager of the Chester County Food Bank. 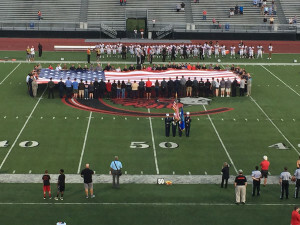 Most recently, the AFJROTC cadets, along with local first responders, unveiled a flag measuring 30 by 60 feet on the football field Friday, Sept. 11 just before the first home game for the Coatesville Red Raiders. It was then followed by a moment of silence in honor of 9/11 and the national anthem. The PA771 AFJROTC at Coatesville High School is dedicated to serving their nation and community, and has set a goal of 1,200 service hours for the 2015 – 2016 school year.